Kendrick Lamar is the undisputed king of hip-hop. Widely regarded as the best rapper in the game, his first two studio albums have become certified classics. In his short career, he’s already become one of the greatest rappers of all-time. He has an indestructible desire to be the very best, and he has accomplished that. One of his earlier tracks comes off his debut studio album, Section.80, is “Rigamortus”, a nearly three-and-one-half minute master class in rap that proved to truly be a preview to the greatness that was to come. Kendrick Lamar seated in a corner of an art gallery. Regarding the track, Kendrick’s team said this: “Death can be so beautiful at times. Boasting bars as mad as Marilyn Manson, one grim rapper emerges to hold hip hop ransom. Hailing from Compton, Los Angeles, one of America’s most neglected graveyards, Kendrick yields his sickle (ballpoint pen) to pry open the caskets of lyricism, musicianship, and tradition. The emcee, once known as K. Dot, hence displays an heir of irony in his verses, murdering the fraudulent with the same weapon used for shedding light on realness.” This perfectly encapsulates the feel of this song as Kendrick’s rapping is otherworldly here. He minces the jazzy beat to shreds with his rhymes, so when he says that your favorite rapper is dead because he killed them, you believe him without a doubt. On the streets of New York City. 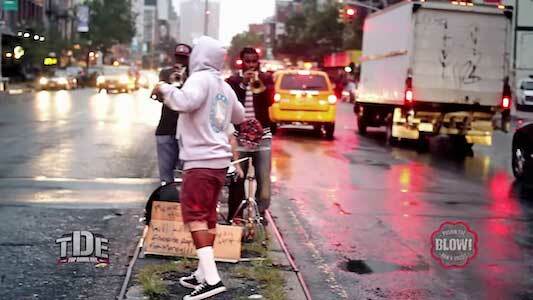 The video is directed by The ICU, and features Kendrick at various locations in New York City. The hustle and bustle of the city that never sleeps really fits well with the frenetic pace of Kendrick’s rhymes. The video features shots of Kendrick paying respects to his fallen competition as they lay motionless on the street. We also get scenic shots of a cemetery, as Kendrick raps in a gallery and on a busy New York street corner. Kendrick is dressed in his usual modest fashion, and one of his ensembles features a pair of low top, black chucks. It’s a cool video that really fits not only the song, but also his humble beginnings. 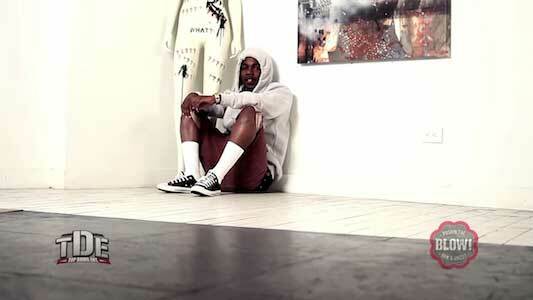 Kendrick Lamar seated in a corner of an art gallery, shot 2.